We’d love your help. Let us know what’s wrong with this preview of Dactyl Hill Squad by Daniel José Older. Magdalys and her friends flee to Brooklyn and settle in It's 1863 and dinosaurs roam the streets of New York as the Civil War rages between raptor-mounted armies down South. Magdalys Roca and her friends from the Colored Orphan Asylum are on a field trip when the Draft Riots break out, and a number of their fellow orphans are kidnapped by an evil magistrate, Richard Riker. To ask other readers questions about Dactyl Hill Squad, please sign up. Does this book end on a cliff hanger or require you to continue reading the series? Cherise You will probably want to read the rest of the series because it's great. So much fun. A cleaver and entertaining way to introduce real historical events (think Draft Riots and Gangs of New York) to middle grade readers. A mix of historical and contemporary slang keeps the prose fresh and appealing to contemporary readers. Older really upped his game. This is great stuff! I'm not giving this a rating because I am in two very different minds about it. Part of me is all "Yay! Five stars! Historical adventure with a smart, brave girl of color—nay, an entire cast of characters of color— and dinosaurs! Plus, it very sneakily teaches really important history lessons about the North during the Civil War. And dinosaurs!" And the other part of me was all "Two stars because the science just doesn't make sense. I'm not even a scientist and I know that. I mean, if dinosaurs I'm not giving this a rating because I am in two very different minds about it. Part of me is all "Yay! Five stars! Historical adventure with a smart, brave girl of color—nay, an entire cast of characters of color— and dinosaurs! Plus, it very sneakily teaches really important history lessons about the North during the Civil War. And dinosaurs!" And the other part of me was all "Two stars because the science just doesn't make sense. I'm not even a scientist and I know that. I mean, if dinosaurs survived into the 19th Century, that would have had a tremendous impact on the path of evolution for other species. If humans had evolved at all, they would have probably done so very differently and there's a good possibility that things like Shakespeare and the Civil War wouldn't even have happened. I just...the SCIENCE." My review is based on the ARC which was actually given to me by a friend. I loved it! As of this moment it is my favorite middle grade of the year! I really liked that he gave us something fun and educational. I know the lingo is accurate (but he does explain that in the informational section) but it makes sense why he does it! I like that he came up with mini-dactyls and well just mini dinosaurs in general. And that he came up with shorthanded names for these dinosaurs as if they did evolve with My review is based on the ARC which was actually given to me by a friend. I like that he came up with mini-dactyls and well just mini dinosaurs in general. And that he came up with shorthanded names for these dinosaurs as if they did evolve with us. He touched on real issues that were happening in that day and age, and made a bunch of kids heroes! PLUS ALSO it does such a smart great job of integrating some pieces of Civil War history that aren't as widely taught, plus also a rad trans character! But also just a lot of fun! In an unstable world where Black people still had to fight for their freedom and right to be seen as equal human beings (gee that hits way too close to home no matter how I try to spin it.) Magdalys and her friends fight for survival, friendship and family. If you’re a parent or educator reading my review, I recommend you leave your gr @Kidlitexchange #partner - I received a copy of this book from the Kidlitexchange network in exchange for an honest review. All opinions are my own. If you’re a parent or educator reading my review, I recommend you leave your grown up brain behind before you jump into the world of Dactyl Hill Squad. It has dinosaurs and humans living side by side the way we have pets and farm animals nowadays. Once you’ve taken care of that, prepare to be swept in a whirlwind of past paced events, battle scenes and so much more. If I have any “issue” with this book it will be the neck-breaking pace that doesn’t quite allow the reader to soak in the world building. However you will quickly fall in love with Magdalys and her friends and before you know it you will be rooting for these orphans to make Riker regrets the day he decided to make them his new targets. I knew I had to read this when I first heard of this book because 1) dinosaurs, 2) it was written by one of my favourite authors, Daniel José Older. What a hoot this book was! I loved the alternate history where dinosaurs coexist. Unfortunately, all the other horrible things of this time period (1863) also exist, so main character Magdalys Roca is no stranger to racism and the unequal treatment applied to people of colour. After getting trapped in a riot and a barely evading a kidnapping attempt I knew I had to read this when I first heard of this book because 1) dinosaurs, 2) it was written by one of my favourite authors, Daniel José Older. After getting trapped in a riot and a barely evading a kidnapping attempt, and a fire at the orphanage she lives at, Magdyls and some of her fellow members of the orphanage escape to Brooklyn. Magdylys and her friends (other children of colour) become involved with a group helping escaped slaves, but also people kidnapped in New York and sent down south to become slaves. The story revolves around Magdylys discovering her ability to converse with dinosaurs, and helping rescue the remaining orphans from the kidnappers. I always like to kick my reading year off with something fun, something promising to kick off a reading year. Dactyl Hill Squad has been on my to-read list since it was announced, pretty much, so it seemed like an auspicious start. It's just your average Civil War story centering on a group of orphans of color, one of whom can communicate with the dinosaurs that are used for transport and labor. One night, while protagonist Magdalys and her friends are out at a Shakespeare performance, they get s I always like to kick my reading year off with something fun, something promising to kick off a reading year. Dactyl Hill Squad has been on my to-read list since it was announced, pretty much, so it seemed like an auspicious start. It's just your average Civil War story centering on a group of orphans of color, one of whom can communicate with the dinosaurs that are used for transport and labor. One night, while protagonist Magdalys and her friends are out at a Shakespeare performance, they get separated from their guardian in a mob and--oh, sorry, did you just register the dinosaurs bit? Yeah. If your first response is to question how the dinosaurs survived and what major world-altering consequences that would have, this probably isn't the book for you because it's never really explained, just taken as a fact of the world, with an added dose of magic in Magdalys's ability to communicate telepathically with the giant beasts. If you're still in touch with your inner child or know a child of chapter-book-reading age whose immediate response is "Whoa, dinosaurs, COOL!" then pick this one up. For that matter, Dactyl Hill Squad isn't really your typical Civil War story either, ignoring the obvious dinosaurs in the room. This one is set in New York and kicks off with the real-life-inspired Draft Riots, when white New Yorkers, upset at the prospect of being drafted to a fight that might end slavery, rioted and destroyed buildings in black neighborhoods, including the Colored Orphan Asylum, rendered here in fictional form. The key villain in the story is based on a real person, Richard Riker, who sent free blacks south to slavery on minimal or insufficient evidence. Notes following the story explain the historical inspirations for people, places, and events in the story, and I'm not too proud to admit that I wasn't familiar with a lot of his inspirations. Different with a capital D and super fun! Kids are going to eat this series up. Civil War in an alternate America with all the action in this volume in New York City. Dinosaurs are domesticated in this world and our orphaned heroine has a telepathic link to them that enables her to direct their actions and win their loyalty. Issues of race, class and prejudice are threaded through the story and well integrated. The dinosaur battle scenes are wildly entertaining and the villains completely despic Different with a capital D and super fun! Kids are going to eat this series up. Civil War in an alternate America with all the action in this volume in New York City. Dinosaurs are domesticated in this world and our orphaned heroine has a telepathic link to them that enables her to direct their actions and win their loyalty. Issues of race, class and prejudice are threaded through the story and well integrated. The dinosaur battle scenes are wildly entertaining and the villains completely despicable! A satisfying conclusion here but the ending also leads right into the next installment. Back matter includes information on dinosaur species and notes on weapons and "words" including the use of modern language with period slang defined. Dactyl Hill Squad is one of those books that tells you to hold tight and then floors the accelerator. The action is well written and paced perfectly while set among Civil War era New York. Wait.. it's also full of Dinosaurs. I'll get back to that in a minute. This was my first read of a book by Mr. Older and I'm in. I love how he knits historical fact into the story line giving the book the feel of the era. The lead character, Magdalys Roca, is one of the strongest female characters I've come ac Dactyl Hill Squad is one of those books that tells you to hold tight and then floors the accelerator. The action is well written and paced perfectly while set among Civil War era New York. Wait.. it's also full of Dinosaurs. I'll get back to that in a minute. This was my first read of a book by Mr. Older and I'm in. I love how he knits historical fact into the story line giving the book the feel of the era. The lead character, Magdalys Roca, is one of the strongest female characters I've come across in a long time, and that is true of all the women in this book. They are truly brilliant. I'll admit that at first I had a hard time with the dinos and that was purely due to the funk of the book I had read prior to this one. The further into it I got I became more enamored with the idea and would love to see a movie version. I'm also glad to see there were no punches pulled with the casualties in the story. It's rare that a children's book deals with death and injury in such a way, but it fits well with the story, and the turbulent time the book is set in. I can't wait to read the next installment, and dig into some of Mr. Older's other offerings. I was drawn to this book by the unique premise. Dinosaurs and humans coexist, and both the North and the South are using dinosaurs in the Civil War. They are used in place of horses, to deliver mail and to fight or attack. The main character Magdalys (Mags for short) is an orphan who discovers she can communicate with the dinosaurs, and becomes involved with the war effort. When I read that she could communicate with the dinosaurs, I was imagining that the book would have a bit of Eragon-and-Saphira vibe to it, where the dinosaurs talk to Mags, but in actuality, it’s more that Mags can sense their feelings and emotions. I was hoping for more of a friendship between the two species, but that wasn’t really the case. I liked Mags, and admired her desire to find her brother and her other siblings to reunite her family. I wish the book had done more with the historical aspect. I did enjoy the notes at the back, but there were only a couple of passing references to famous Civil War battles. I would have liked a little more history, but that’s my personal preference. I had trouble keeping track of all the orphans, since they were all introduced at roughly the same time, and they used nicknames and their real names. I loved Miss Josephine and wished she were in the story more. Her sass was great! Historical fiction with dinosaurs? The combination just barely works (IMVHO) - the history occasionally got short-shrifted because the dinosaur part needed to be worked in. Luckily there are author's notes about the Draft Riots, the Colored Orphan Asylum, the period slang and dinorsaurs to help fill in blanks and point readers to additional information. 4.75. Absolutely excellent middle grade novel that mixes historical fiction and... dinosaurs. Some of the scenes were incredibly heartbreaking, but written in a way that middle school aged kids will get a lot out of both the history and the adventure. Fun middle grade novel that puts orphan kids riding on dinos fighting human trafficking during the Civil War. I would have liked to get to know the characters a bit better, as this book was heavily plot driven, but it is the first in a series, so maybe we'll get to know the characters better as it goes along. Overall, it was fun and full of action and adventure, and I think kids who like dinosaurs and history would love it! Interesting concept...fighting slavery with dinosaurs! MC is a compelling female teen-I want to know more about her story! Oh, and she can communicate with dinos & terras! Great role model! For grades 4/5+ due to content, violence, including a lynching (afterward is described). Amazing author notes, especially the section that told about basis/ background for some characters. The detailed notes at the end of the book describing what certain people/places were based on honestly interested me more than the rest of the story. Although Part 3 was by FAR the best part, it took a long time to get there and the writing style left a lot to be desired. This took me three months to get through. A strange and fascinating story that imagines life during the Civil War... with dinosaurs. Magdalys and the rest of her courageous squad risk their lives to save their fellow orphans from a kidnapper with an evil plan, based on a real-life villain from the 1800s. I recommend this unique adventure for ages 8 and up! Wow... this book has dinosaurs, the civil war, lost orphans, secret societies and more. It's fun and educational but parents and teachers would be wise to chat with their kids about the material as slavery and racism are major themes. There is also a scene where the orphans find a dead body. Pretty heavy stuff for a middle grade novel but I have no doubt kids can handle it. Weirdly, this reminds me of Harry Potter (in all the best ways): scrappy, unlikely kid heroes using magic to team up together to fight injustice. Great writing, fun plot, plenty of action, and just-right level of historical events (Civil War!) woven in to make it interesting. Very fun, solid middle grade. So much fun! Civil War and...dinosaurs! I was going to complain about the modern language, but in the back matter (engaging and informative), the author says yeah, I took some liberties with the dialogue. So okay. Can’t wait for book two so we can find out how the Dino-wrangling main character saves her brother. 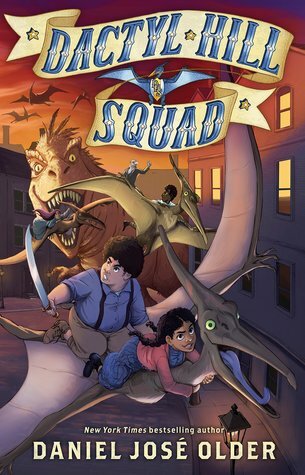 Action-packed middle grade adventure that re-imagines Civil-War era New York City with dinosaurs! This is a great blend of real history and dinosaur fantasy that I think a lot of kids are going to love. There are even detailed notes at the end of the book giving more info about the history and other books to read! Plus we get a young black heroine from Cuba who can talk to dinosaurs with her mind, which is really fantastic. Magdalys is an orphan living in New York's Colored Orphan Asylum just as racial tensions are exploding in the city and war rages down south. The Kidnapping Gang has been rounding up black children and adults and selling them into slavery (based on real events) and has captured most of the other orphans from the asylum. She and her friends (the Dactyl Hill Squad) must ride dinosaurs and try to save the other kids before they are shipped away. Who knew I would love this book this much. To be honest, it seemed really random at first; orphans in 1863 running away from the Kidnapping Club on dinosaur back? Yep, I was unsure. But as the book progressed on it just got better and better, and not a lot of authors can pull that off. This book was about Magdalys Roca, an orphan from the Colored Orphan Asylum who is being targeted, among others, by an evil magistrate, Richard Riker. As the story wore on I actually got curious and searched who Rich Who knew I would love this book this much. This book was about Magdalys Roca, an orphan from the Colored Orphan Asylum who is being targeted, among others, by an evil magistrate, Richard Riker. As the story wore on I actually got curious and searched who Richard Riker was, apparently he was really a magistrate who hated colored people. Everything about this book is gripping. The main character herself is really lovable and sharp. The way Daniel Jose Older interpreted dinosaurs and the civil war was nearly impossible but it all came together in a very creative way that I LOVED. So yeah, did I underestimate it? Yes and I'm ashamed. Is it my new favorite child? Yes, and I regret nothing. Full video review of Dactyl Hill Squad and Charlie Hernández and the League of Shadows can be found here.